A 3D gaming laptop. Toshiba updates its Qosmio Series with the X870 and we see the new Ivy Bridge processors make their debut in its 17-inch gaming machines. The substantial features offered should entice customers to purchase this 3D enabled gaming machine that we will review in this article. Toshiba introduces the 17-inch Qosmio X870 with the latest Ivy Bridge processors from Intel’s stables. The last-generation models of the X870 (X770-10J and X770-11C) had received good reviews from us and left quite a positive impression. The X870-119 is in the direct successor to the X770-11C which, came with a 3D display and shutter glasses. Other than the updated hardware, there are a few significant design changes that are of particular interest to a buyer. At the time of the test, Toshiba offered the Qosmio X870 in three different variants with the X870-124 being sold for 1799 Euro, which would be the entry level product of the series. You get an Intel Core i7-3610QM, the Nvidia GeForce GTX 670M with CUDA and Optimus technology, 8 GB DDR3 RAM and a 750 GB hard drive. A large 128 GB SSD hard drive and a Blu-Ray disc drive are also included. The more expensive variant is the X870-11D for 1899 Euro. The processor, hard drive, disc drive and video card are the same as in the X870-124. However, Toshiba doubles the RAM to 16 GB which would be the reason for the price increase. The premium model of the series, the X870-119, which we have for this review costs 2199 Euro. Unlike the other two models, it has a 3D capable Full HD display and a 1 TB hard drive. But, it does not include Nvidia’s automatic graphics switching Optimus technology. The specifications of the X870 make for good reading. The following review shows us how the machine proves itself in the field. Compared to previous X770 models, the Qosmio X870 has received some minor updates in regards to its case. Toshiba cut down on the red color. 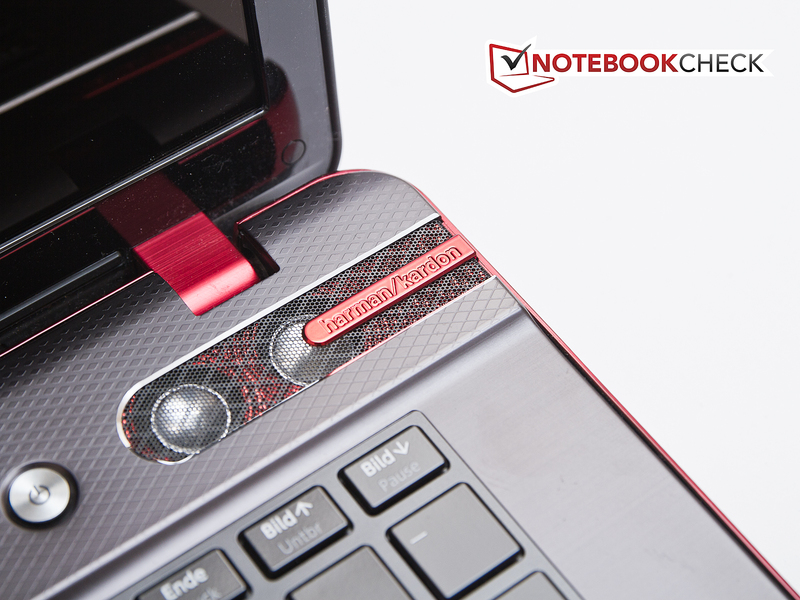 The laptop lid is of a uniform color, and also on the inside, the red color is only used for accentuation. The design is more "mature" as compared to its predecessors. 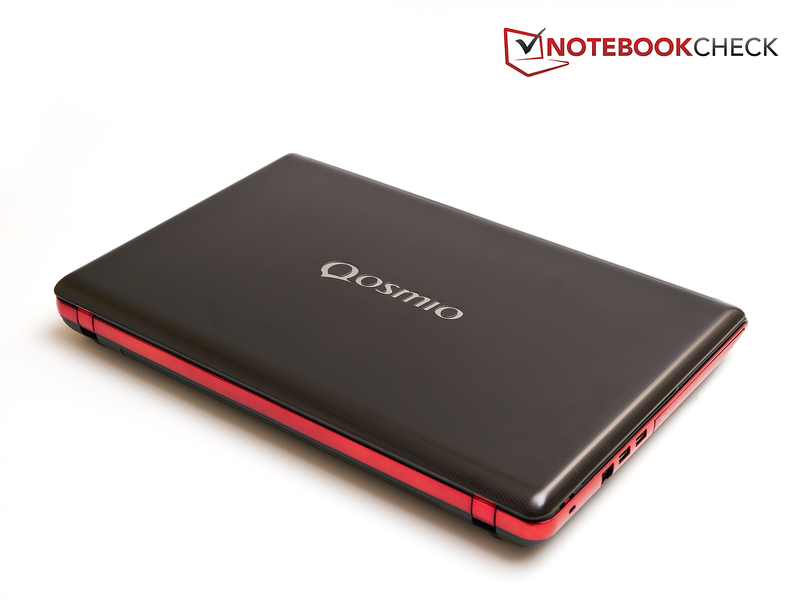 We like the red frame a lot, as well as the illuminated Qosmio logo on the lid which makes the laptop look nice. The surface is, for the most part, made out of aluminum, making the notebook pleasant to grip. You need some time to get used to the dotted surface of the laptop lid and thanks to this you can largely avoid fingerprints on the surface. Even when opened, the X870 scores high in terms of stability. The palm rests and the area above the keyboard don't yield under pressure. However the keyboard does yield in the number pad area when pressure is applied. In other areas of the keyboard, the yielding is negligible. The large display is held securely in place by two hinges. Even though they are set firm, they allow for the comfortable opening of the notebook with one hand. The display can be twisted with moderate effort, and some minor image errors become visible. In conclusion, the design and the stability of the Qosmio are convincing, but there will be certainly some users who will mourn over the old design. Even though the Toshiba Qosmio X870 does not provide plenty of connectivity options for its size, most users will be more than satisfied with four USB 3.0 ports. The newer USB 3.0 standard is a very welcome addition that can helps in high speed data transfer of very large files when compared to the older USB 2.0 standard. The other ports available are standard for such a system and there are no alternative data transfer ports like Thunderbolt or eSATA present. Something to note is the presence of the Bluray drive on the left side of the laptop rather than on the right where most other laptops have their drives. This has meant the shifting of the vents to the right side and annoying placed right where the right-handed user would place is/her hands when using a mouse. For network connectivity, the Qosmio X870 has an Intel Centrino Wireless N 2230 card, as well as a RJ45 port which is connected to the Atheros AR8161/8165 card (Gigabit), The Intel card supports the most widespread WLAN standards 802.11b/g/n. Bluetooth 4.0 is also integrated in the system. 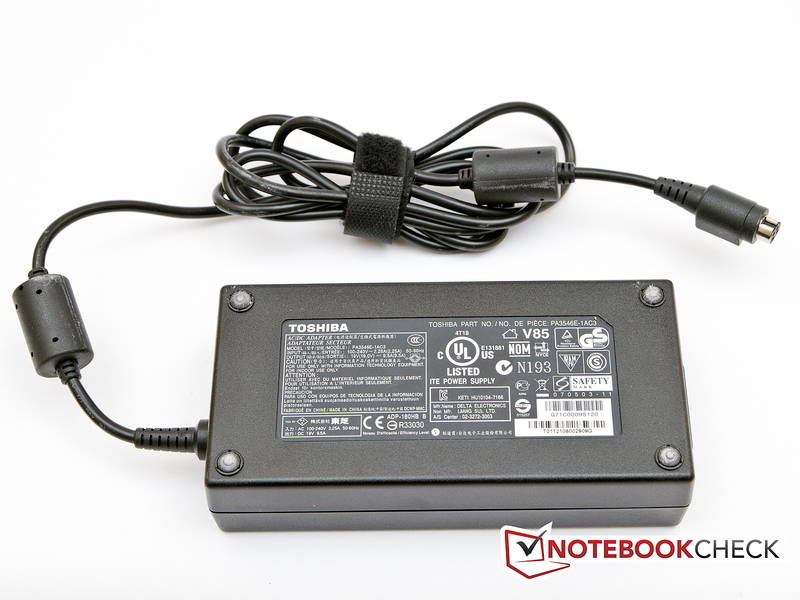 Despite the higher price, Toshiba has not included any accessories with the system. The only add-ons available are the power supply unit, some documentation for the laptop and the important warranty. If the buyer has purchased the 2D version of the laptop, then a pair of 3D shutter glasses is included with USB cables for charging. 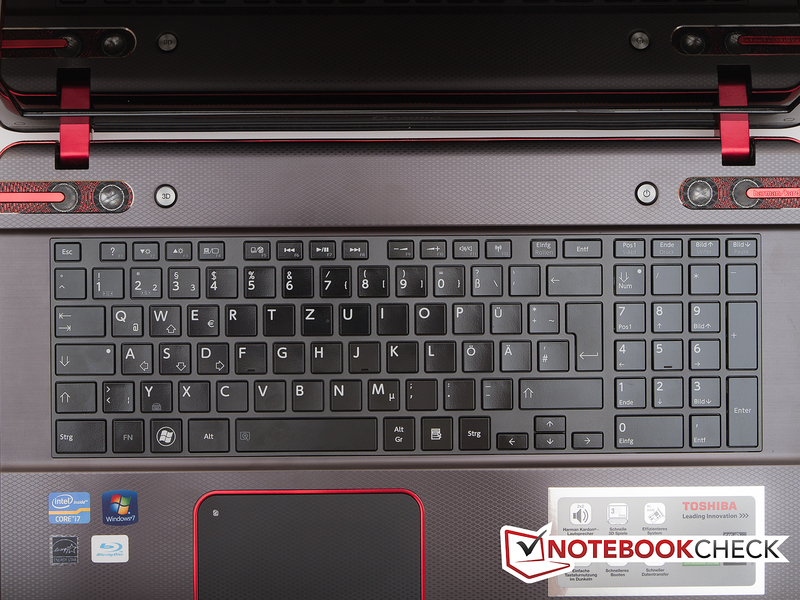 The hardware is easily accessible through a large panel at the bottom of the laptop. 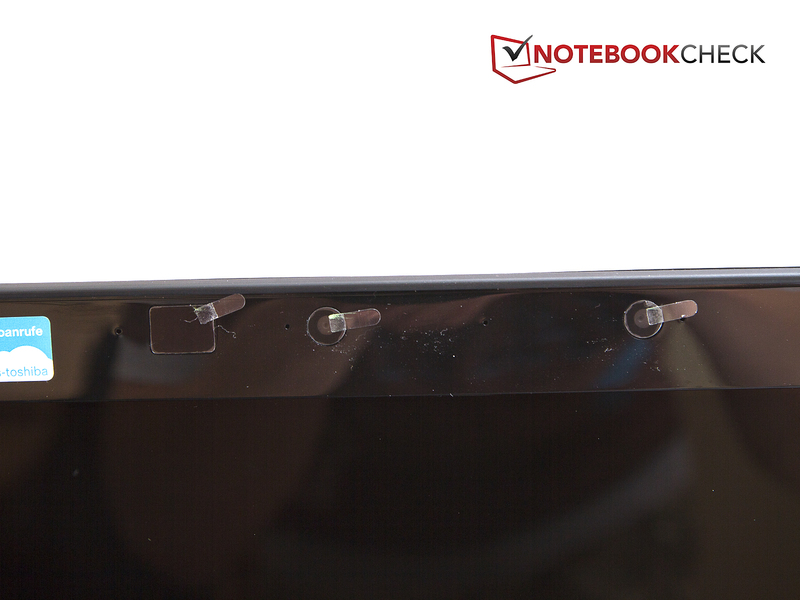 The panel is secured using a screw located above the battery that is covered by rubber stopper that needs to be removed with the help of a needle or a sharp screwdriver. On removal of the cover, you will gain access to the hard drive and the SSD drive, two of the four RAM slots and the Intel Centrino WLAN card. We were stunned by the way the SSD looked like it was held by just connectors with no other type of securing device. On closer examination, we realized the soft protective support provided to seat it securely in its position. The fan and sink are not easily accessible to a normal user and needs some skill to remove it. But this could lead to users voiding their warranties. Toshiba offers warranty for a period of two years for all Qosmio models. If you complete the Toshiba warranty registration, your machine will be picked up within Germany and Austria in case of a defect. As mentioned previously, to be eligible for that service, you will need to register with Toshiba (customer support). 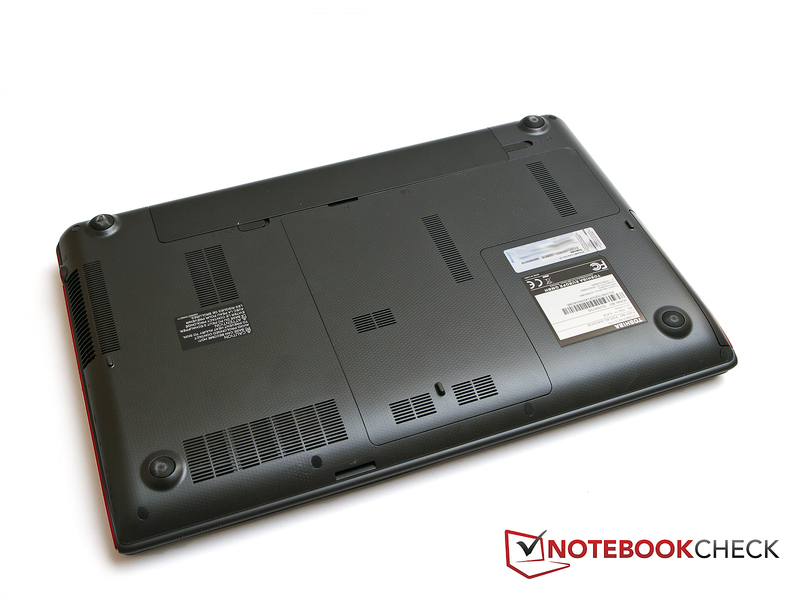 A large cover, which can be used to easily reach the hardware parts, is situated on the back side of the Toshiba X870. The cover is secured by a screw located above the battery bay. In turn, this screw is covered by a rubber stopper which is best removed with a needle or a thin screwdriver. If you remove the cover, you will gain access to the hard drive and the SSD drive, two of the four RAM slots and the Intel Centrino WLAN card. First, we were a little bit stunned that the SSD drive, on the first sight, looked like being held in place by the connections only, and otherwise lied loosely in the tray. However, there is a small cushion on the cover which holds the drive in place. The fan as well as the heat sink are not accessible to a layman and further opening the case you risk to lose the warranty. 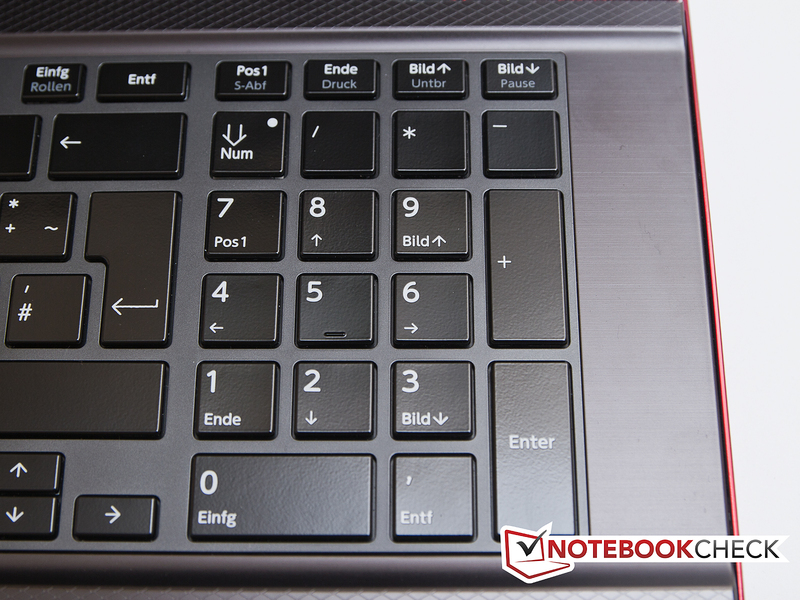 The Toshiba X870 comes with a chicklet-style keyboard. Each key has a dimension of 14 mm x 14 mm and should be big enough for most users. The gap between the keys is 4 mm. The typing noise is pleasant and is neither too loud nor too soft. In our opinion, the key stroke could have been better defined and more responsive. During the test it was quite usual that some letters were skipped as the keys wouldn’t register the tap. Key travel is decent and is suitable for a gaming notebook. 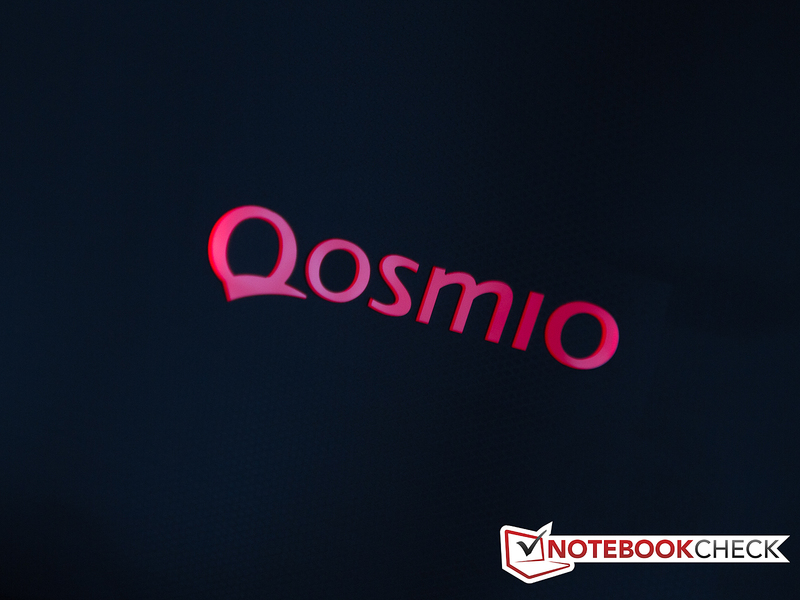 As befitting a notebook directed at the premium segment, the Qosmio has a back-lit keyboard allowing gaming and productivity in the dark. The illumination is in red and cannot be varied. Toshiba has avoided the implementation of keys for special functions normally associated with a gaming device. It has simplified matters by providing a single key to activate or deactivate the 3D functionality of the display. The only other key is the power button on the right side. The touchpad of the X870 is not as pleasing as the keyboard. Although it's pretty big considering its width of 122 millimeters and a height of 80 millimeters (diagonal is approximately 130 millimeters), the mouse buttons were found wanting. The buttons are integrated into the surface to form a clickpad and the disturbing part was the movement of the entire clickpad assembly when the surface was depressed to register a click. Other than this issue, the touchpad performed adequately. The surface is pleasant, and pointer accuracy was found to be good. The tactile feedback is good and the clicking response is satisfactory. Toshiba Qosmio X870 series comes with two different types of displays. The cheaper non-3D models come with a 1600x900 resolution HD+ screen while the high-end 3D display comes with the superior Full-HD 1920x1080 display. For this reason, the notebook is accompanied by 3D glasses from Nvidia. Another feature that Toshiba offers is the dual camera setup that allows the user to capture stereoscopic images that can be played back as a 3D movie by the built in software. It is left to the user to decide the usefulness of this feature. The Qosmio X870 did well in the display brightness tests. The maximum brightness of the display was 370 cd/m2 and the average was found to be around 334.5 cd/m2. Unfortunately, the drop in brightness from the lower edge of the screen towards the upper edge is pretty big. The brightness decreases from a maximum of 370 cd/m2 to 292 cd/m2 which is pretty noticeable when viewing dark scenes and pictures. This resulted in a poor illumination of just 77%. On the other hand, the black level is really good at 0.41 cd/m2. Blacks in pictures, movies and games look black and not gray. As a result of the low black level and good maximum brightness, the contrast ratio amounts to a considerable 821:1. The fact that Toshiba does not automatically throttle the brightness when running only on battery speaks in favor of the display. The display also does well when it comes to color representation. It can almost fully reproduce the sRGB spectrum, and only in regards to the AdobeRGB spectrum are there noticeable differences. This should not, however, be an issue for the gamer as these comparisons are extremely important to a professional graphic designer. In outdoor operation, the Qosmio X870 still scores high despite the reflective display surface. Responsible for this is the good contrast and the high brightness of the display. However, the display cannot be viewed in direct sunlight. In regards to viewing angels, the Toshiba display does perform well. If you look head on at the display, there won't be any issues. You can also comfortably sit with several people around the notebook and watch a movie. However, you can only do it in 2D. In 3D mode you will need to sit right in front of the notebook and at the right distance. In addition, every viewer will need appropriate glasses. In 2D mode, the display can be tilted without compromising the image. Eventually, at some point color inversion will take place on the Qosmio X870. The premium model of the Qosmio series has a 3D capable display (120 Hz) which we have, of course, tested extensively. People interested in the 3D experience will be delighted with the display performance. The display does generate the 3D effect pretty well with the help of the shutter glasses. Although the seen image loses some of its brightness due to the glasses, this loss can be compensated, thanks to the high brightness values of the display. Also games can be played in 3D. Some games provide an excellent experience thanks to the 3D functionality while others should be played without the effect. For instance, Diablo 3 is especially fun to play with 3D glasses. Everything looks more realistic and the names of the characters as well as the description of the items "reach out" to the viewer. Gamers who want maximum performance will push the Qosmio to its limits. More details will be available in the subsequent sections. 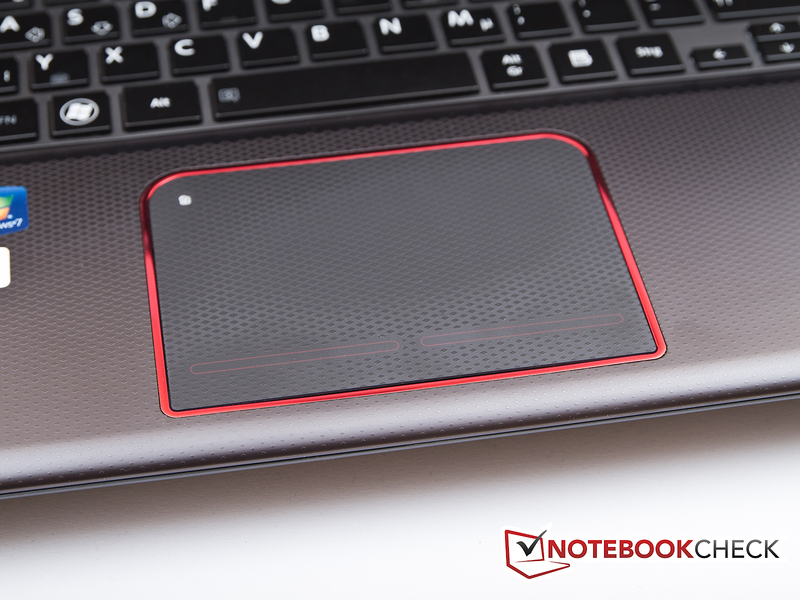 The review notebook comes with decent hardware that doesn’t disappoint. Intel's latest generation quad core processor provides more than enough processing power and the GeForce GTX 670M is able to handle the most demanding games. 16 GB RAM and an SSD drive provide additional performance. A Bluray drive is built in to take advantage of the Full-HD screen that comes with the laptop. 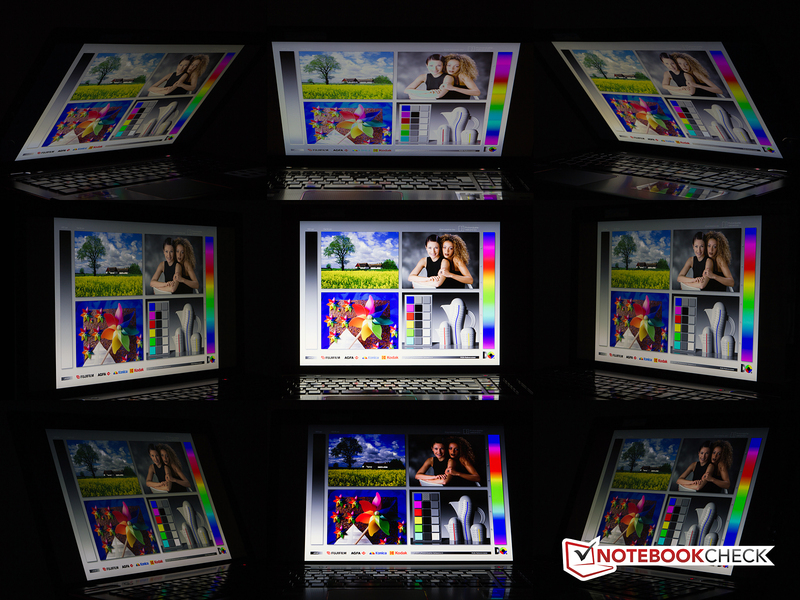 Thanks to the 3D display and the Nvidia shutter glasses, 3D movies are not an issue for the notebook. 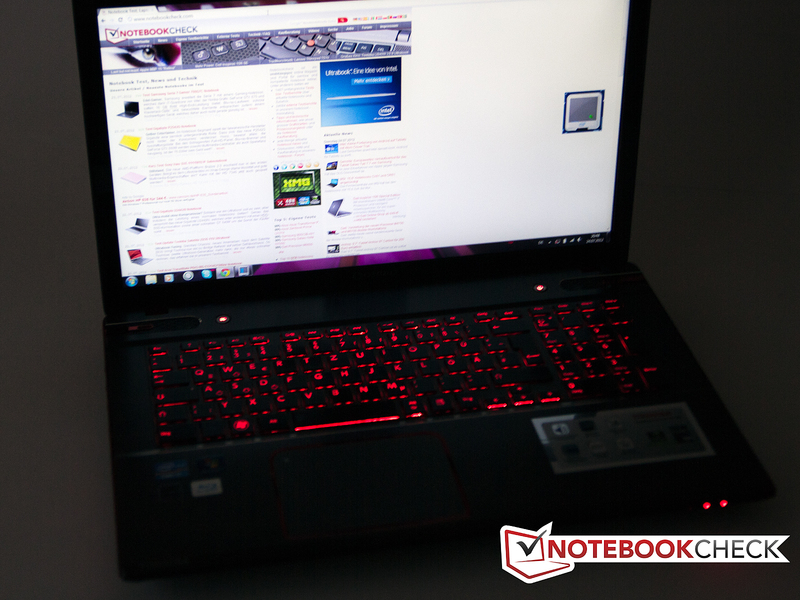 Thus, the notebook can perfectly function as a gaming machine as well as a multimedia station. The Intel Core i7-3610QM is one of the latest processors based on the Ivy Bridge microarchitecture. Thanks to multithreading, the quad core processor can handle up to eight threads at the same time. Each core is clocked at 2.3 GHz by default. If you should need more performance, there is the possibility to use Turbo Boost which offers dynamic overclocking. 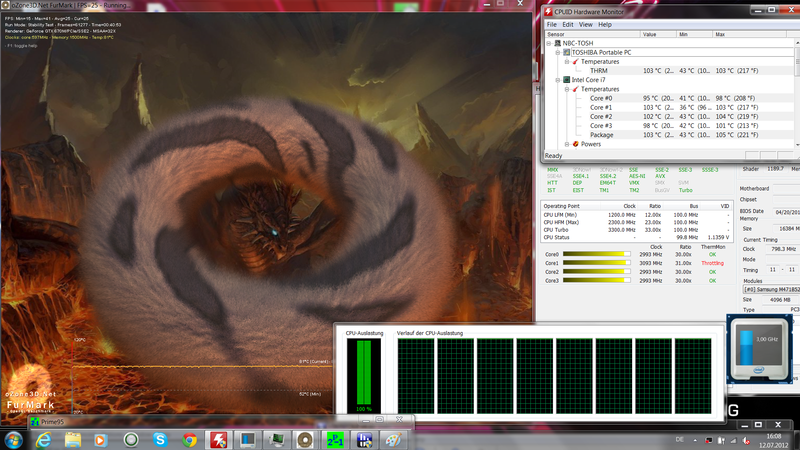 If all 4 cores are needed to be overclocked, the processor jumps to 3.1 GHz. For two cores or one core, 3.2 GHz and 3.3 GHz clock speeds are possible respectively. As Ivy Bridge (compared to Sandy Bridge) is mostly a die shrink, space for improvement is limited. Compared with similar clocked models of the Sandy Bridge family, the gain in performance is around 5 percent. Nevertheless, the processing power is adequate to handle even demanding tasks like video editing. The TDP of the processor is 45 W. The Intel HD Graphics 4000 IGP is available but comes deactivated in the top model of the Qosmio X870 series. To estimate the performance of the processor we use CineBench 11.5. First, we look at the performance of one core using a benchmark designed for single 64 bit CPUs. 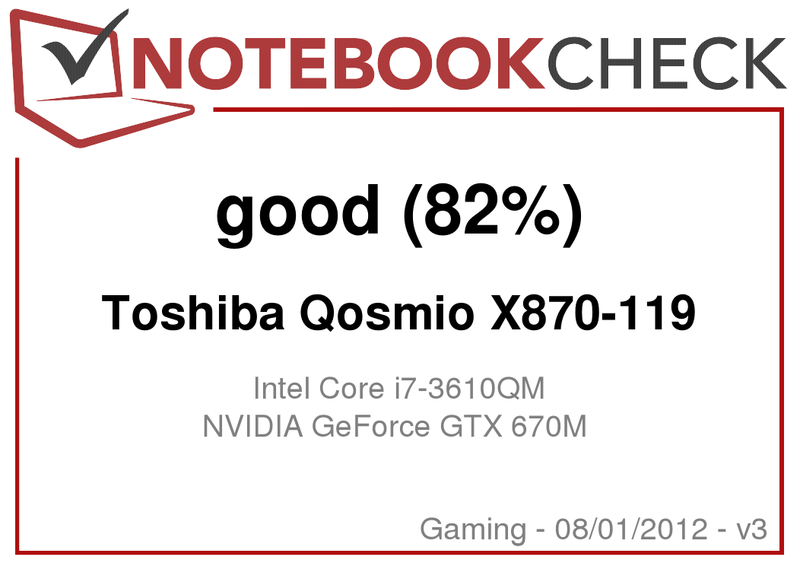 The Toshiba Qosmio X870-119 notebook scores 1.33 points. Compared to other notebooks which use the Intel Core i7-3610QM, X870 achieves similar results. The results differ by 3 percent at most. The highest score of 1.37 points, achieved with an i7-3610QM processor, belongs to the Medion X7817 (MD98058) (3610QM, GTX 670M). Even if all cores of the processor are tested using the 64-bit Multi-CPU benchmark, there is still no significant difference between the i7-3610QM processors in different laptops. Qosmio X870M achieves a score of 6.03. 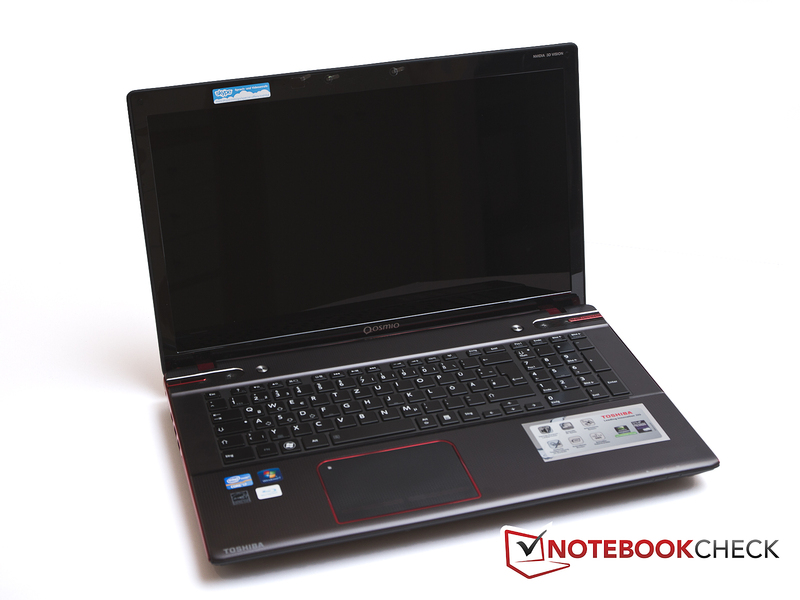 The Medion X7817 (MD98058) (3610QM, GTX 670M) notebook leads with 6.21 points. But the performance of the 3610QM doesn’t match up to the superior Intel Core i7-3720QM. For instance, the Asus G75V (3720QM, GTX 670M) got 6.8 points in the same benchmark and is 13 percent faster than our test model. During the tests of the processor Turbo Boost has functioned without any issues and a throttling of the processors did not occur during testing. To estimate the system performance, we used PC Mark 7. Here the Toshiba Qosmio X870 scores 3752 points. Also in this test, notebooks with the i7-3610QM processor have similar results. These results are not based on the performance of the processor and the video card only, but on the performance of the whole computer system. So systems having an SSD drive is a huge advantage over systems with a normal hard drive. For instance, the Asus G75VW-T140V (3610QM, GTX 670M, SSD) scores 4788 points due to the presence of the SSD. Toshiba Qosmio X870 possesses two different drives: a fast SSD drive offering 128 GB capacity for the system partition and a conventional hard drive with 1 TB capacity which serves as an additional data storage space. In comparison with other SSDs, the built-in SanDisk drive is fast, but not the fastest. Its 400 MB/s sequential read speed is surpassed by some other SSD drives, like the Crucial M4 which is used in the Gigabyte U2442N notebook. The M4 reaches 500 MB/s read speeds. The write speed of the SSD is better at around 300 MB/s which is decent and puts the SSD performance in the middle of the pack. The built-in graphics card is an Nvidia GeForce GTX 670M, which is a high end graphics card. However, this video card is based on the older Fermi architecture and not, as some other graphics cards of the 600 series, on the new Kepler architecture. Despite the older architecture, the performance of a GTX 670M is still above that of a GTX 570M on which the GTX 670M is based upon. Compared to a GTX 570M, the GTX 670M also has a higher clock rate. Thus, the GTX 670M is roughly at the same level as the AMD Radeon HD 6970M. Thanks to the GTX 670M, most new games such as Battlefield 3 and Anno 2070 can be played smoothly on high details and resolution. To assess the performance, we used the 3D Mark 11 benchmark. Here the GTX 670M in Toshiba's Qosmio X870 achieves a score of 2970 and places itself below other machines carrying the same GPU. 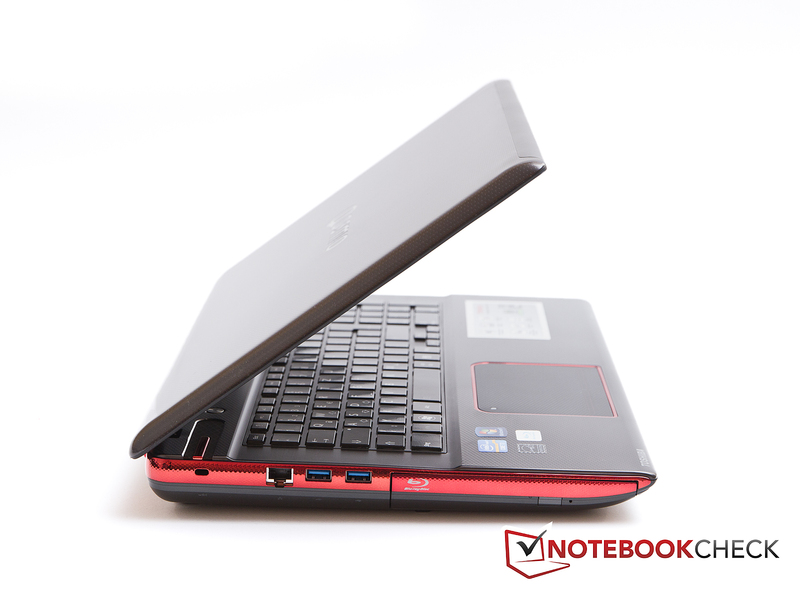 The notebook performance is almost equal to that of the Alienware M17x (2630QM, HD 6970M) which scores 3030 points. But the GTX 670M in Toshiba's notebook easily overtakes the GTX 570M in the performance stakes. The GTX 570M in the MSI GT780DX-i71691BLW7H (2670QM, GTX 570M) gets about 2661 points in the benchmark and is therefore 10 percent slower. If played in regular 2D mode, most recent games will run smoothly on high details and resolution. On the other hand, titles such as Battlefield 3 played on max settings will push the notebook to the limit. Although in the 3D mode, with 3D glasses, the number of frames per second falls dramatically, it should still be possible to play most games on lower details. We did some tests using several recent titles and have tried to play each game in 2D and 3D. First, we tested a first-person action game, Deus Ex Human Revolution. In normal 2D mode, frame rates were very good. On maximum settings we achieved 41 fps. In the 3D mode and with 3D shutter glasses, we saw lower rates: min: 59 fps, high: 54 fps und ultra: 21 fps. You can roughly say that in 3D you will lose 50 percent of the performance. This is also understandable given that two images instead of one are processed in parallel for 3D gaming. We have noticed the same while testing the other titles. Playing the game The Elder Scrolls V: Skyrim: While in the 2D mode, all benchmark results were in the green range. Again, those results are different to what we have seen in the 3D mode: low: 58 fps, med: 37 fps, high: 26 fps und ultra: 13 fps. The gameplay was very poor in 3D mode as the screen resolution and settings were increased. Further information on the gaming performance of the Geforce GTX 670M can be found in our comparison chart. The powerful hardware of the laptop requires appropriate cooling; therefore the X870 is not exactly quiet. When idle, the cooling system is always on, and the fans are responsible for a noise level of 32.1 dB – 34.5 dB. The resulting noise is audible to the user. Under load, the fans become much noisier reaching 39.8 dB, and under extreme load in the 3DMark test, up to 44.1 dB. 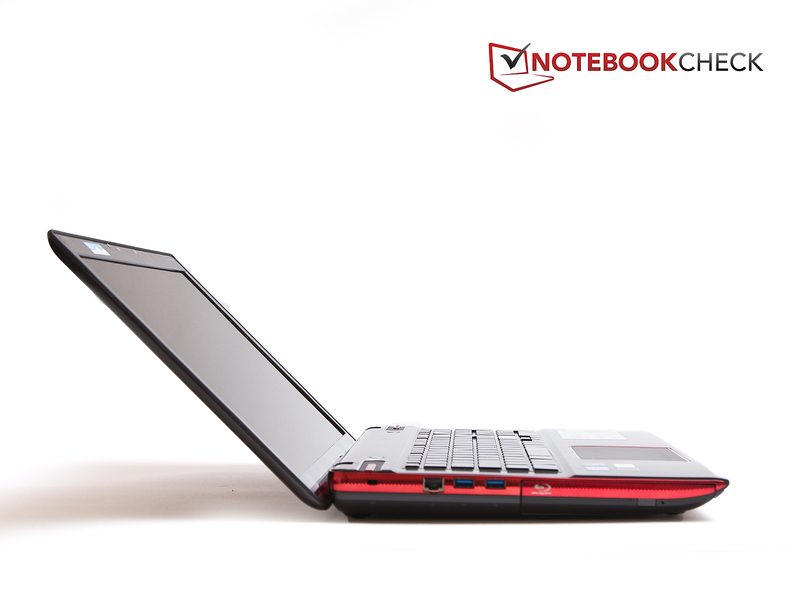 The notebook is anything but inconspicuous and it is recommended to use a headset. Also when playing DVDs or Blu-ray discs, the notebook is not exactly quiet. Here the noise level reaches 38.8 dB. During quiet movie scenes, the notebook noise becomes uncomfortably noticeable. We noticed that the power supply of our test model makes a low humming noise. At full load, this becomes prominent. This noise is pretty annoying and very disturbing in the long run. The humming power brick might be a malfunctioning one and might not affect the entire series of laptops. 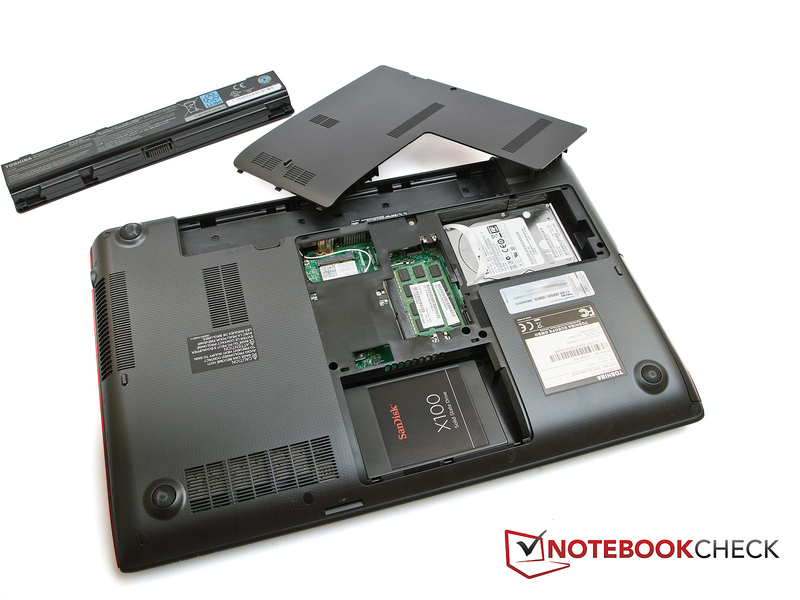 We have already tested the new Ivy Bridge processors (especially the 3610QM Quad core processor) in previous reviews, and high temperatures are something that almost all notebooks had in common. In this regard the Toshiba Qosmio is not much different: During the stress test, we have been able to measure a maximum temperature of 48.2 degree Celsius on top of the machine. Palm rests are not significantly cooler, with 29.2 degree Celsius on the left side and 41.2 degree Celsius on the right side. The laptop's bottom part reaches a maximum temperature of 54.5 degree Celsius. Depending on usage, surface temperatures remain usually below the theoretical maximum levels. However, while playing compute-intensive games such as Battlefield 3, we could observe temperatures that were close to the maximum values. Despite their improved architecture, the new Intel processors still require quite a lot of cooling. Already, while testing other notebooks with Intel Core i7-3610QM, we have seen throttling of the processors at very high temperatures and even complete shut downs. 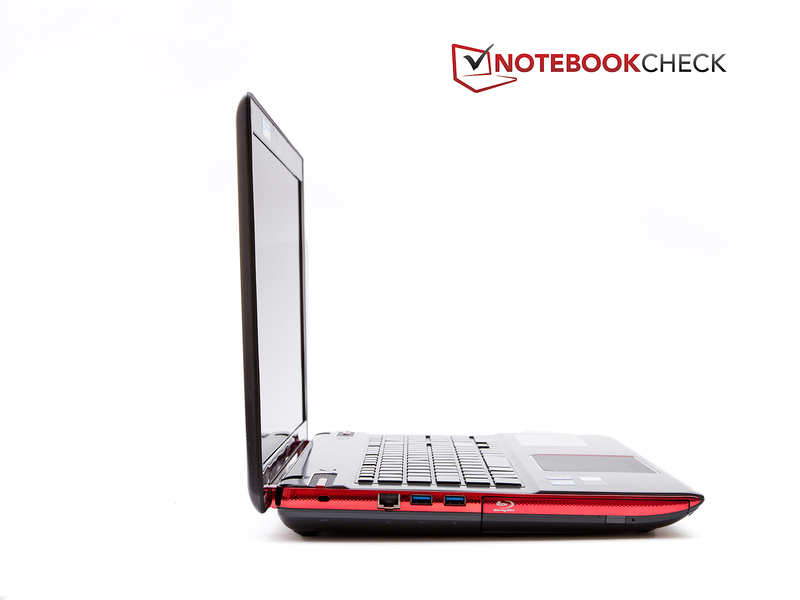 Unfortunately, Toshiba Qosmio is not an exception, but is better than some of the competition. Temperatures still rise over 100 degrees Celsius and after about 40 minutes under stress (100% CPU und GPU load), it begins to throttle. However, the notebook does not automatically shut down after a long period of time. The observed throttling under extreme load does not affect the performance. Therefore, we could not find any difference in 3D Mark 06 results. Also, while playing Battlefield 3, there weren't any limitations in terms of performance. The speakers are alright, but can't compete with those in top systems. They perform better towards their middle volume levels; however, the sound becomes slightly less defined the higher the volume is set. Unfortunately, the bass is missing completely. Nevertheless, movies can be comfortably played back on the notebook, and you can also confidently enjoy games without using headphones. As expected, the Toshiba Qosmio does not belong among most energy efficient notebook models. Nevertheless, the energy consumption, at least at low load, is low thanks to the new generation of processors. While idle, the laptop uses at least 28 W. However, the maximum lies at 52 W. You can clearly notice the lack of Nvidia Optimus support and this means that the GPU is always active and drawing power. Under load, the consumption rises rapidly and reaches 124-175 W.
We use the program Battery Eater for testing the runtime on the battery provided with the laptop. In order to test the best possible runtime, we use Readers Profile. Here, the Qosmio X870 achieves a run time of 2 hours and 13 minutes. This result is roughly the same as indicated by Toshiba on the product page. It speaks of 2 hours under normal conditions. The other two models of this series last for 4 hours. One reason for the better run time would be Nvidia Optimus. Optimus is missing on the X870-119. Accordingly, the other tested run times fall short. In our WLAN test, which comes closest to real life usage, the notebook did not even manage to stay on for 1 hour. The run time was about 52 minutes. Anybody who wants to see a DVD or Blu-Ray movie while traveling will be disappointed: After 78 minutes the lights go off, and most movies won't be finished. Under load, the battery is able to hold out for 33 minutes. 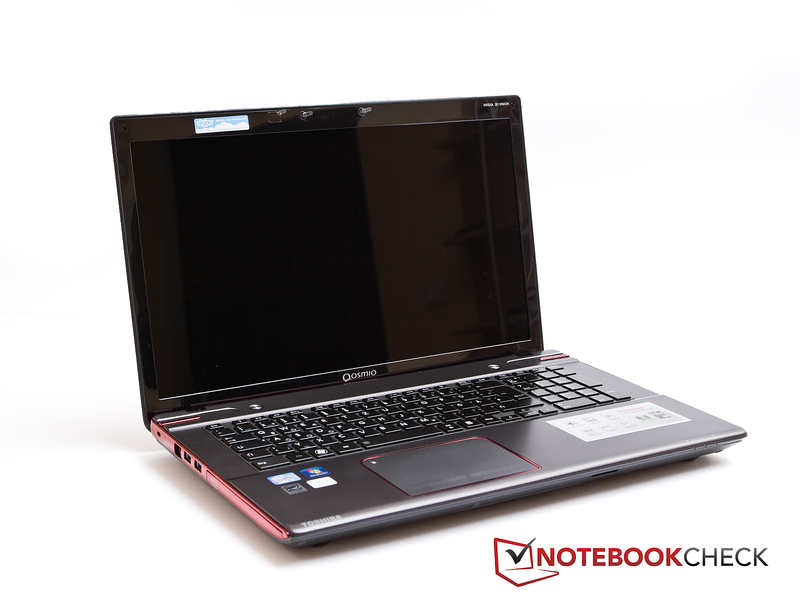 Toshiba offers the customer the Qosmio X870-119 which is a potent gaming and multimedia notebook. The built-in hardware provides sufficient performance to play the latest games at high details and resolution. But you do have several issues with this laptop. First, you have the selling price of the notebook: Toshiba prices the gaming machine over 2000 Euro which is not little money. In addition, the Qosmio X870 feels itself comfortable next to a power outlet. Without external power supply, the notebook runs out of power pretty quickly. Interesting features are, of course, the 3D glasses from Nvidia and the possibility to play games in 3D. Despite that, many games don't exploit the 3D potential sufficiently. Furthermore, select movies can also be seen in 3D. For the 3D effect, you require expensive displays and you can tell that Toshiba has made effort to offer a good display. The built-in panel impressed us. The input devices were up to our standards for the most part. The keyboard is very useful and appropriate for gaming. The touchpad did disappoint us, but someone who is essentially a gamer will take advantage of a proper mouse. The lack of Nvidia Optimus in our high end version of Toshiba's Qosmio X870 is seen to a disadvantage. With Optimus, the notebook would have probably been quieter and cooler for office use and lasted much longer than the run times that were recorded. Altogether, the Qosmio X870 certainly has its charms, but the laptop is too expensive for the features it offers. Whether the 3D display is worth the premium over the two smaller models should be evaluated by the buyer. The cheapest version of the X870 is already available for 1599 Euro, and the expected performance shouldn't be much below our expensive top model, due to the same CPU and GPU in both models. Behind the cover, there is a lot of hardware that can be upgraded. On the bottom, you will find a maintenance cover which is secured by a screw. A 3D (stereo) webcam is also built in. The sound system is made by Harman Kardon. ... and an illuminated logo on the display lid. A number pad is present, of course. From the side, its not exactly the slimmest notebook. The power adapter, as well as the notebook, are huge. The good quality display with 3D functionality and good performance. The 3D effect "eats up" 50 percent of the performance. Most people looking for gaming notebooks will inevitably end up with an Alienware device. For 2100 Euro, you can get Alienware M17x R4 which is leading our DTR chart at the moment. 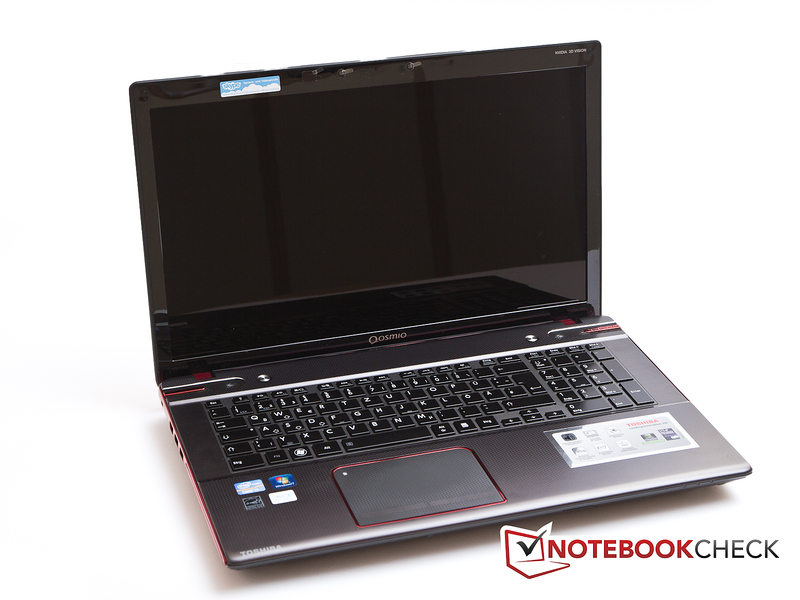 Also with 3D and similar configuration, there is the Asus G75V notebook. Other interesting candidates are the MSI GT70, the Schenker XMG P702 PRO and the Samsung 700G7C.